Perhaps one of our more high profile shows, due to the casting of Jack Black in the title role. 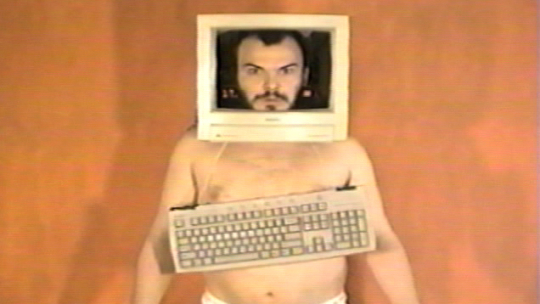 Computerman is the fourth of the original five Prime Time shows that premiered at Thoi on Vine. When the original concept became stale, it was reborn as a space-faring epic, and after taking part in a historic crossover with Time Belt, it was again reborn as a cartoon adventure, at which point the audience had enough. Computerman was eaten by Doug TeNnapel's hungry Sockbaby at the January 2004 screening. Both Computerman's ship and his show self destruct in a second attempt at show reinvention- an attempt thwarted by the audience. Computerman was powered down by three votes in January of 2004. Eugene shrinks down and goes inside Computerman to save him from a deadly virus.